One of the finest views in Kerry has to be from the summit of Geokaun Mountain. It’s only 266m (872ft) but the mountain has commanding views of Valentia Harbour, the McGillycuddy Reeks, the Blasket Islands and the Skellig Islands. 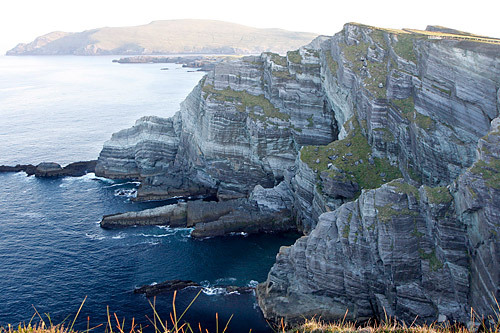 You can also take a short detour to see the views from Fogher Cliffs. There are four different viewing points on the mountain with very informative panels describing the various views. One morning last year I left Killarney at about 4.30 in the morning and arrived at the summit of Geokaun at about 6.30, just in time to see the sun rise as a red ball and turn the entire bay to gold. A marvelous sight. 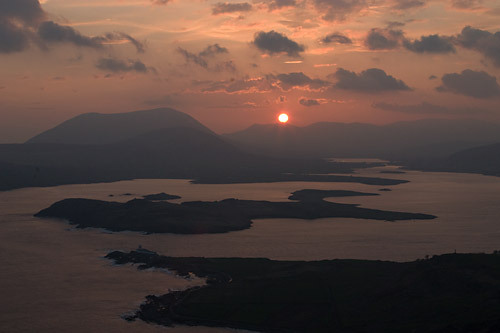 To get there: There are two roads that run the length of Valentia Island – take the high road. While you are in the area, another marvelous viewing point is just a 10 minute walk from Blasket View House, the home of Johnjoe and Mary O’Donoghue. They are situated on the Skellig Ring road, about 2 miles south of Portmagee. For any geologists listening the cliffs here are about 400 million years old and face west into the Atlantic. They are about 300 metres (1,000 ft) high and offer great views of the Skelligs and Puffin Islands. Open: 7 days – late opening during summer months. We spoke before about community spirit and what it can achieve to improve all our lives. I recently gave the example of the great work done by the community in Bonane in creating the Bonane Heritage Park near Kenmare. Well here is another great achievement by the World Champion Mountain Runner John Lenihan and his co-workers. 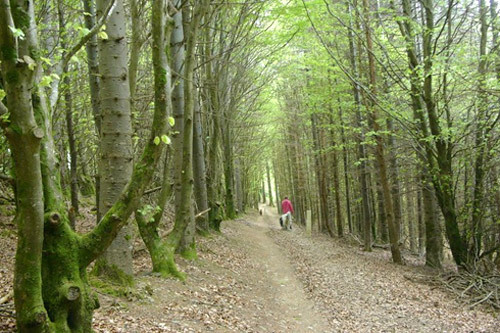 Out of a hill and forestry plantations around Ballymacelligott they have carved a marvelous walk that is becoming hugely popular. It was back-breaking work digging laying paths and driving wheel-barrow loads of concrete down steep slopes to make bridges but John and all the others involved must be getting great satisfaction watching the big numbers of people doing this walk on a daily basis, especially at the weekends. Glenageenty is an area of mystery, myth and folklore, a wild and rugged landscape that was once the sanctuary to some famous heroes and bandits alike. This loop is the shorter of two loops and it takes you along its riverbanks and woodlands to listen to singing birds, gurgling streams, and the underfoot crunch of fallen hazelnuts and oak leaves – a paradise of peace and tranquillity. For those with an interest in birdlife, ravens, hen harriers, kestrels, pheasants and cranes are all regular sightings – for nightimers it’s a haven for bat life! Wild goats can frequently be seen sunning themselves in forest clearings. Tree lovers will encounter oak, birch, sallow, hazel, mountain ash, white and blackthorn, sycamore and various types of spruce in abundance. 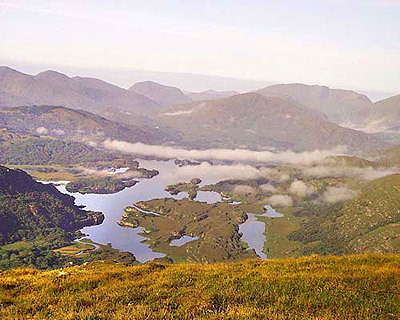 There are glorious vistas of Corran Tuathail, Ireland’s highest mountain, the gap of Dunloe and Mount Brandon. It was in this glen that Gerald the last Earl of Desmond was beheaded in 1583 after months of hiding in dense woods – a plaque now marks the spot where his blood stained the earth. The loop takes you by the site of the Desmond Castle and on via the Ravens Glen waterfall to the ruins of Sean Thaigh Og’s cabin where in 1916 Robert Monteith evaded his enemies after the unsuccessful landing of arms at Banna Strand. From this secluded glen we can see the route and the hideaway taken by Stephen Fuller in 1923 when he was sole survivor of the Ballyseedy massacre. In fact John Lenihan’s grandmother gave up her bed for Stephen Fuller the night he was brought here. More recently, valley floor, the Glounageenty River the rugged hillside and the forest glades inspired and honed local mountain man John Lenihan into peak fitness in 1991 before he travelled to the Matterhorn in Switzerland to become the first Irishman to win the world title for mountain racing. John has also held the record from the fastest time on Corran Tuathail, from Loch Acoose to the summit and back in 1 hr and 11 minutes. This beautiful walk encompasses all aspects of nature, from the flora and fauna to a wide variety of birds which can be seen and heard in Tarbert Bay. This walk can be broken up into three distances and there are other walks in the area so if walking is of interest to your Group telephone Tarbert Bridewell for more information. There are no boats involved here. 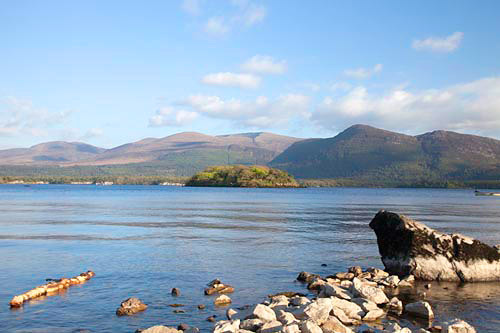 Many people don’t realise that when they are at Ross Castle they are actually on an island. Ross Island – beautiful area, great walks with magnificent view of Loch Léin and the surrounding mountains. Mining for copper at Ross Island dates back to over 4,000 years ago. The people had incredible technical knowledge to be able to smelt and mould copper and bronze objects back then. For example the ‘furnace’ had to be at over 1000 degrees centigrade to melt the copper. In the 18th and 19th century the mines were opened again. The first steam engine in Ireland is said to have been used here to pump out the lake water – a continuous problem that eventually closed the mine. Between 1804 – 1829 over 5,000 tons of copper ore was sent to smelters in England. Over 500 employed. The copper extracted at this time had a value of £80,000, a considerable sum when you consider Muckross House was built for £30,000. Walk Length: 2.75 kms – 17 stopping points along the route. Booklet: Booklet on Ross Island Mining Trail is available at Ross Castle, the Castle is open 7 days during summer months, 9am – 5pm. Another booklet – Ross Island and the Mining Heritage of Killarney by William O’Brien is also available at Ross Castle and is a fascinating read, with lots of maps and photos from recent archaeological excavations. Costs just €2.50. How to get there: Route 1: Torc Waterfall carpark on Killarney/Kemare N71 – follow the steps by the side of the waterfall until you come the bridge over the Owengarrif river. Following the course of the river upstream out on to the open mountain. There is a pathway all the way to the summit. Route 2: Take first left after main enterance to Muckross House, from Killarney, Upper Torc Carpark. Turn left on leaving the carpark and follow the Old Kenmare Road. A short distance after reaching the open mountain you will see a sign for the Torc Mountain path on your right. Length: 5 mls / 8kms approx. – Red Deer, shed their antlers in April. New antlers, calves appear about now (rut in October). – Butterwort (below) – found on damp ground, a carnivorous plant. – Wheatear – look for white rump as it flies off. Blue/grey on top, black wings, and black stripe across its eyes, pale orange breast, wagtail size. Winters in Central Africa. View from summit (see above): Long Range River, Killarney Town, Muckross House, Lakes, McGillycuddy Reeks, Loch Guitane to the east. Books: available from the libraries and bookshops. The Derrynane Dunes Nature Trail combines history, flora and fauna and the purest of sea air coming in from 3,000 miles of Atlantic Ocean. Expect to see and hear skylarks and grass hoppers and if lucky see a natterjack toad, which looks like a frog but has a yellow streak on its back and runs rather than hops. At the moment the ponds are full of natterjack tadpoles and the the first of the developed toads. And this time of year you’ll see lots of beautiful wild orchids, including the very rare Bee Orchid. These are a protected species so please don’t pick them. Other flowers of interest on the dunes are the rare Sea Pansy, Eye Bright and the Marsh Cinquefoil, along with a carpet of Kidney Vetch. These trails are great for children because as well as the healthy exercise, they are fun and they will gain an interest in the environment that will stay with them for life. 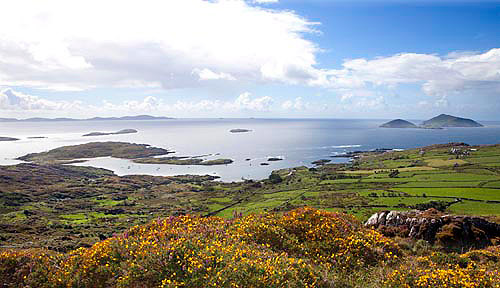 After the trail why not visit Derrynane House, the home of Daniel O’Connell, the greatest Irishman of all time. From our school days we know that he achieved civil rights for Catholics but he also supported women’s rights and the abolition of slavery, when it was not popular to do either. Derrynane House has a marvelous collections of items belonging to O’Connell, including the magnificent coach used to take him through the streets of Dublin on his release from prison. There is also an excellent audio visual on the life O’Connell. You can also walk across the sandbar on the beach to Abbey Island and see the graves of Mary O’Connell, Daniel’s wife, and also the graves of some of the children. At the rear of the house are magnificent gardens. Some of the trees growing here are from seeds and cutting of endangered species collected in South America. This is part of a programme in association with Edinborough Botanical Gardens in Scotland. Open: 10.30 – 6 (last admission at 5.15) until the 23rd November. Buy an OPW Heritage Card. €21 for adults / €55 euros for a family. We’ll begin with a self-guiding walk in a valley that many of the listeners may never have heard of, let alone been in but this valley is an archaeological treasure chest. At Kilmore Cross, at the bottom of the Conor Pass, near Cloghane, is a valley called Loch a’ Dúin (The Lake of the Fort). This valley contains a remarkable number of monuments from the Bronze Age (2,000BC – 500BC)- Bronze Age farming on the Dingle Peninsula. There are over 89 stone structures, many dating from 2,500BC. Including wedge tombs, standing stones, rock art, fulach fia, a fortified island and over 12 km of prehistoric pre-bog field walls dating to c. 1,300 BC. 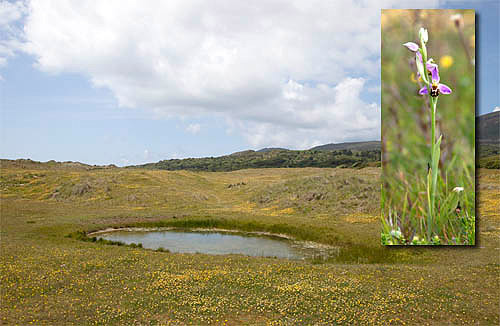 The valley is also of interest to bird watchers, botanists, and geologists. Start/Finish: Kilmore Cross, the trail is well marked.